Before we start talking about putting the make up on I wanted to tell you a few things to keep in mind before you apply it. Placing less on is much better then more. Just because you have in your mind that putting more makeup on may be better since the frames tend to cover the eyelids and eyebrows a bit just might not be them best idea. Glasses accentuate things on the face such as way to much makeup to that small scratch you have on your cheek. The best thing to do is go lighter and keep things blended together well. Look at the frames that you have. If you have frames that are thicker or dark frames than you may want to take it down a notch with the makeup. Go with a natural look rather then all kinds of crazy and loud colors. Colors that are pastels such as a pink, purples, tans, peach or even a taupe. Now if your glasses are thinner. Like a wire frame or even frameless then spice it up with some darker and more bold shades such a gray, deeper pinks, purple, greens and so on. You also have to keep the lenses that you have in mind as well. If your lenses are thinner, making your eyes look smaller then you may want to go with a bright, yet light color shadow. You can do a dark line of eyeliner to the top lid if you want to bring the eyes out just that little bit more. Now if the lenses are thicker, making you appear to have bigger eyes then I would go with darker colors so it will tone down the eyes a bit. 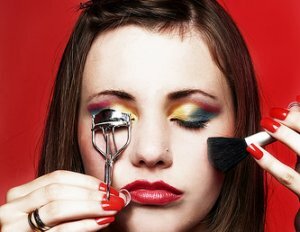 Okay now that I have told you things to look out for before you go and try doing your makeup I am going to tell you other things that you can do to have a great looking face that others will wow over. Even if you do have your glasses on i guarantee you will look amazing. Do not go with eyeshadows that sparkle or shimmer with glitters. This will not look so good with the lenses because they already have a reflective shine to them. Plus they may fall in to the eye causing irritation. 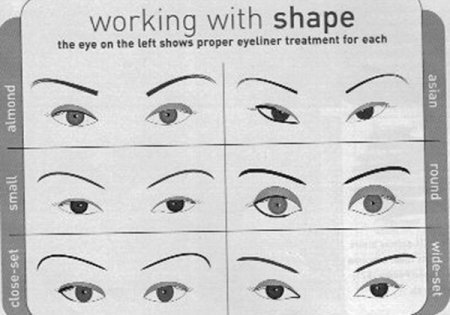 Your eyebrows should be kept nice and shapely. The glasses do sit right at the brow, so they will be noticed. If you think that they need to be touched up you can get an eyebrow pencil and add it to them, but remember do not over due it. Make sure that the shadow you use is well blended on the eye. If not it may fall off or you can use a cream shadow, so you are guaranteed that it will not go anywhere except on the lids where it belongs. If you have think dark frames you will want to find a darker color for those lips as well so there is an equal amount of darker and lighter shades going on. Here is the problem a lot of girls that try to wear make up with glasses have, when they put on mascara some times the lashes will hit the lenses and cause black or whatever color you have on to not be on the lashes anymore, but all over the lenses instead where it does not belong. So how do you fix thins mess? Try curling the lashes or getting a curling formula instead of one that puts length to them. There you have it girls, now you can wear your stylish glasses and have make up on that will not interfere with your sight or an annoying mess. Whoa yeah I bet you are all happy now that you can do this the right way and look astonishing. Enjoy your new look girls and have fun with it. Share a link to a page on How To Wear Makeup With Glasses and we will consider it for placement on this page.